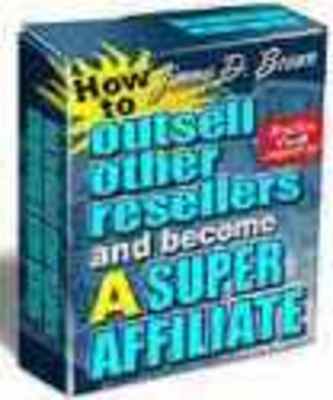 How to Outsell Other Resellers and Become a Super Affiliate! Its not a trick question. How would you like to become a top-selling affiliate for whatever program you choose? Im serious when I tell you that YOU - yes YOU - can begin earning high commissions no matter what affiliate program you are promoting. 5 of my affiliates earn about 80 of the commissions paid. 10 of my affiliates earn commissions every pay period. 20 of my affiliates earn commissions at some point. 80 of my affiliates either earn *very* little commissions or no commissions at all. These are some mind-boggling statistics and, in talking with others, they seem to be the norm for MOST affiliate programs. So, I became a detective after finding these numbers. And I found out why the top-selling affiliates are getting all the sales. How to earn more sales to YOUR link, even though youre selling the EXACT same product at the EXACT same price as a gazillion other resellers. The *exact* reasons why the top-selling affiliates in any program are so successful and why the others are left in the dust. NOTE: More importantly, youll learn how YOU can do what the top-sellers are doing! An I cant believe it can be this easy, 5-step affiliate formula for success that works EVERY time no matter what affiliate program you are involved in. The #1 biggest obstacle to affiliate marketing that is behind the failure of 95 of all resellers -- and how YOU can avoid it! HINT: If you do this wrong, its almost impossible for you to become a top-seller. 5 necessities for EVERY succesful affiliate marketer to complete. These are the life of all affiliate marketing and cannot be altered or omitted in any way. Youll do them right from day one! 6 sure-fire ways to separate yourself from the competition even if you dont have a huge mailing list, a high traffic website or a well known name within the industry. What 98 of ALL AFFILIATES are doing wrong with their marketing that is costing them thousands of extra commissions every year...and how YOU can learn this secret in less than 5 seconds. How to get the MAXIMUM benefit from your promotion by doing one simple thing differently. NOTE: It takes thirty seconds to make this simple change to your website. 3 easy ways to make yourself stand out among the crowd of affiliates and pull in orders like you are raking leaves...including 12 quick tip ideas for creating your own unique approach to affiliate marketing. The 2 secrets that you can quickly and easily master to become a top-selling affiliate and 3 reasons why you DONT want to use the advertising materials your affiliate program provides for you. These are just a few of the things in youll find in this short, sweet and to the point course. How to Outsell Other Resellers and Become a Super Affiliate is your ticket to earning more affiliate commissions regardless of who you are or what you are promoting. A quick and easy 4-step system for using incentive marketing to produce immediate results, including a real life example from a top-selling affiliate in 3 separate programs. An almost magical formula for writing recommendations that produce sales and commissions like a charm, including a mini-site sales letter that is a perfect example of how to get EASY orders and 8 quick tip ideas for creating incentive packages that no one can compete with. The 3 questions that you must answer if you want to convince people to purchase through your affiliate link. They are easy -- but, do you know what they are? The hands-down quickest way to see a significant increase in your mailing list in the next 7 days -- HINT: More subscribers = more sales. Youll learn the simple formula for affiliate success. 2 easy ways to use ezine articles to bring in 100 free advertising for your affiliate link and 4 easy ways to use forums (message boards) for a quick boost in your commission checks. 3 ingenius tactics for creating more affiliate sales on the back-end, including several 10-second changes that can be made to your website to bring in up to 543 more commissions. If you order How to Outsell Other Resellers and Become a Super Affiliate today, then youll also receive a FREE 7-day eCourse designed especially to help YOU earn the most commissions possible, with the least amount of work. Ive put together this 7-day eCourse as a Part 2 to the eBook itself. It actually has more pages and information than the eBook! The REAL SECRET to Earning Commissions With Affiliate Programs! A a?Guruas Idea to Get You Started On The Road to Guaranteed Monthly Income! 3 Easy Ways For You To Cash In On Your Own Success With Affiliate Programsa¦Almost Overnight! How To Increase Your Affiliate Commission By Up To A Staggering 500 for ANY PROGRAM! Creating Your Own Ever-Growing Empire Of Affiliate Commissions and Checks!a? The Absolute EASIEST Way to Earn Commissions While Barely Lifting a Finger!a? How to Use a Ready-Made Autoresponder Course to Flat Out Make Your Affiliate Commissions Sizzle! Why you are probably working way too hard for minimum results and a VERY EASY and seldom used tactic that you can begin using today to work much less and see much more profit. How to earn up to 12 times as much (and more!) commission from ONE customer without doing an extra bit of work. An easy formula for *literally* bringing in thousands of dollars in commissions EVERY MONTH. Hint: A few of my buddies are furious with me for sharing this secret becausethey dont want any competition. My own personal list of the 10 best affiliate programs to promote to bring you in the maximum amount of commissions possible for your marketing efforts. Youll be shocked at who isnt on the list -- and who is. How paying for a customer might just be the best method for earning residual affiliate income. Ill show you how my own losses actually earn me hundreds every month...and youll learn how to do it for yourself. 5 easy ways to lose on the front end (yep, losers are winners here!) and profit BIG TIME on the back end by generating even more customers than ever before. The Affiliate Secrets formula for success and how to apply it to so there is nothing left to do but cash your commissions checks with a smile. A legitimate way of generating 500 more affiliate commissions regardless of what program you are promoting...without spending a penny. A super simple (Im still amazed more people havent caught on) way of pulling in commissions without even trying and how you can actually get other people to do the work for you. 4 universal, unchanging principles for affiliate success, including how to setup your own automated systems that do your marketing for you around the clock. The honest-to-goodness easiest way to earn commissions that is available online today. Nothing else comes close to the ease of earning affiliate sales and commissions as this. How to promote your 7 favorite affiliate programs simultaneously without any real effort at all. Once you setup this automated system, it works your promotion for you like remote control. Heres the bottom line: This eBook and part 2 eCourse will help you increase your affiliate commissions no matter who you are or what you are promoting. It doesnt matter if you are a newbie or a veteran, there is something in here for you. I can guarantee you that if you apply the information contained in this course, then you WILL see a significant increase in commissions. As if the information itself wasnt enough, youll also receive master reprint rights to this eBook. Sell it for $19.97 and keep every penny of every sale. You can sell it individually or you can package it together with other materials. Thats up to you. Yeah, I know. Its a no-brainer. Whether you want it just for the information or you are interested in selling it to earn profits from the reprint rights (or both! ), this one is a sure-shot. GUARANTEE: If How to Outsell Other Resellers and Become a Super Affiliate is not everything that I say it is and you are not completely satisfied with it, then I will refund every penny of your money with no questions asked. Thats more than a guarantee, thats a promise.